Extraterrestrial Intelligence: Can it be Contacted? Looking out into the night sky we see thousands of stars. Modern telescopes expand our vision to reveal billions of stars. Stars group into swirling clusters called galaxies. The observable universe comprises billions of galaxies each comprising billions of stars. Some of these galactic objects are up to 4·6 billion light-years distant. On many a clear night in the tropics, I have looked up and marvelled at the splendour of the ever-present slender luminous cloud called the Milky Way. The Milky Way is a galaxy. 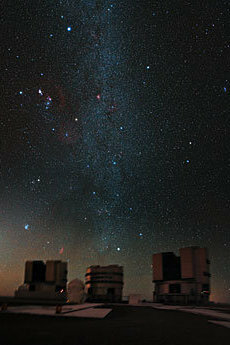 It is currently thought to comprise around 200 billion stars. Our sun is one of its stars. The sun has planets in orbit around it, one of which is the Earth. The Earth supports intelligent life. Of the planets orbiting some of the stars within the vast number of galaxies in the observable universe, is it reasonable to suppose that at least some - by statistical chance alone - should be Earth-like? If so, then it must be reasonable to suppose further that at least some of these Earth-like planets have, like the Earth, given rise to intelligent life. Of course, this depends on a big assumption. We must assume that the necessary and sufficient means and motive for life to begin and evolve are simply an Earth-like environ­ment; nothing more. To the best of my knowledge, current theory asserts as follows. The universe began with a big bang. It was a super-dense microscopic object that exploded into what the universe is today. This explosion occurred about 13·7 billion years ago and is still on-going. This implies that every object in the entire universe originated from the same single point. So, as a consequence of its microscopic beginning, every part of the universe must always be the same age. Science does not know fully what the true laws of physics are. Insurmountable incompatibilities still persist between the major theories. Nevertheless, all agree that, whatever the so-called unified field equations may eventually turn out to be, the whole universe is, and always has been, governed by them. All processes that take place in the universe must therefore behave according to the same rules. These must include the processes whereby a life-supporting planet forms. They must also include the processes by which life begins and evolves. Consequently, wherever life may have arisen in the universe, it should have done so at about the same time and progressed at about the same rate. So wherever life may have arisen in the universe, it should have reached approximately the same stage of development as it has here on Earth. We should therefore expect any alien life, though it may be different from us, to be advanced to little more or less than the stage we are now at, since it has had the same amount of time since the Big Bang in which to get that far. One of the universal laws of physics is that inform­ation cannot travel from one part of the universe to another faster than the speed of light. So when we look out into the universe, we are not seeing the universe as it is. We are seeing objects in the universe as they were when the light left them on its journey to our eyes. How far back in the past we see an object is proportional to how far away it was then from where we are now. 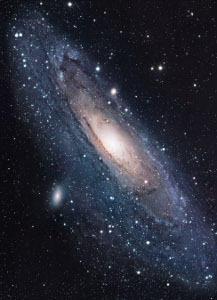 For example, when we look through a telescope at the Andromeda Galaxy, we are seeing it as it was about 2½ million years ago: not as it is now. If we could see through some of the world's biggest telescopes at the Galaxy UDFy-38135539, we would see it as it was 13·1 billion years ago. That is almost 96% of the time back to the Big Bang. So we are not looking at the universe as it is. Each of us sees the universe along his personal event-horizon. This may be imagined as seeing the universe as a continuum of concentric spherical shells of space, each of which contains a portion of the universe that is progressively further into the past. An interesting corollary to this is that we are only affected, gravitationally or otherwise, by objects in the universe as they were in our past. Other objects in the universe, as they are now, do not affect us at all and we have no connection or relationship with them. To us they don't exist. In effect, they're not in our universe. All other objects in the universe-now - that is, as they exist at the same elapsed time since the Big Bang that we are now at - are physically isolated from us. There is an insurmountable fundamental barrier between them and us. Information arriving at the Earth from outer space travelled from its place of origin at or below the speed of light: 300,000,000 metres per second. If an intelligent alien were to send us a message in a bottle, that bottle could not traverse the space between him and us at anything approaching the speed of light. No form of object or vehicle could. Consequently, the only practical means of interstellar signalling is by electromagnetic waves such as light or radio. Marconi's first public radio broadcast took place in April 1897. It is doubtful that his radio signal escaped the Earth's ionosphere. However, if it did, it would by now (2011) have reached stars and planets 114 light-years from the Earth. Proper news and entertainment transmissions did not start until 1920. These were on frequencies (thought to have been around 850 kHz) at which the waves would be mostly confined to hug the ground by the electrical nature of soil and water. It is doubtful whether such signals could be detectable beyond the Earth. It was only in 1928 that experiments first began using VHF (just above 30 MHz) at which signals could possibly pass through the Earth's ionosphere and radiate freely into outer space. This was only 83 years ago. It is therefore unlikely that any alien living more than 83 light-years from the Earth could possibly have so far detected transmissions from Earth. To allow time for VHF transmitters to become reasonably developed, let us reduce this distance to 80 light-years. An alien on a planet more than 80 light-years away could never have possibly detected any intelligence-bearing signals originating from Earth. Conversely, if, as proposed above, we assume that any alien race will advance at the same rate as us (give or take a little), we could never hope to receive an intelligence-bearing signal from a distance greater than about 80 light-years. Our galaxy, the Milky Way, is 100,000 light-years across. That is 1,250 times the maximum range at which we could hope to receive an intel­ligence-bearing signal. The NASA impression of a speculative top view of the Milky Way galaxy is shown on the right. We can never see it this way. We are inside it, so we can only ever see it edge-on. In the image above you can just make out the words "Perseus Arm" in the lower middle. The image on the left is a magnified part of the above image where the word "Arm" of "Perseus Arm" is visible. The location of the Sun is shown. 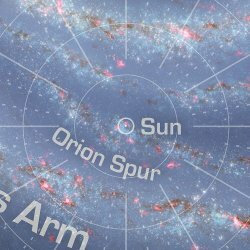 It is located in a string of stars known as the Orion Spur. The small white circle in the middle seems, from the scale to represent a radius of about 360 light-years from the Sun. 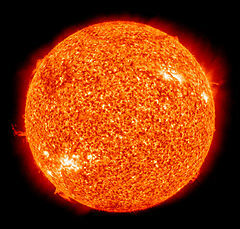 The next larger circle that passes through the "n" of the word "Sun" marks a radius of 5,000 light-years from the Sun. The next larger circle marks a radius of 10,000 light-years from the Sun. The image on the right is of an even larger scale where the letter "S" of "Sun" gives an idea as to the scale and position. In the very centre, where the Sun is located, is a white dot. On the scale of this image, the diameter of the white dot is 80 light-years. This is about as far as the radio signal from the world's first VHF transmission will have reached by now (2011) if it were detectable at that range. As you can see, on the galactic scale, it isn't very far. Please note, however, that this is the current outer limit for aliens to be able to receive transmissions. There is also an inner limit. The first voice transmissions were amplitude modulated (AM). A voice was imprinted upon the radio wave by varying the intensity of the wave in sympathy with the intonations of the voice. 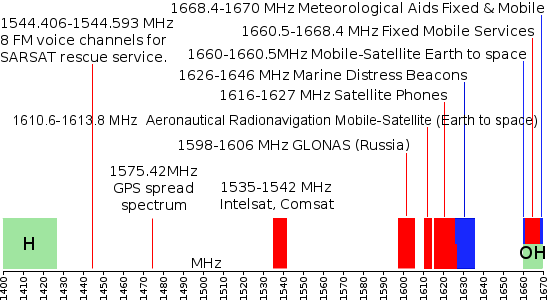 A frequency spectrum of an AM radio signal is shown on the left. It comprises the central carrier wave flanked by an upper and a lower sideband. 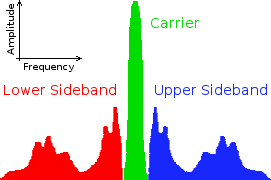 The profile of the upper sideband represents (in the right sense) the frequency spectrum of the voice that is modu­lated upon the carrier wave. The way of detecting this kind of signal is largely self-evident. It easily reveals what the human voice sounds like. An alien listener would not need to know anything specific about human beings in order to receive and hear it. Obviously, the alien is unlikely to know what the sound of the voice represents in terms of words, sentences, grammar and meaning. He would not know the Earthly context necessary for doing this. But at least he would hear it as it really sounds. And he would doubtless realise that it was produced by an intelligent life-form; not by a non-living natural phenomenon. Pretty well all AM transmissions of any significant power take place on the Long, Medium and Short Wave bands. These are either reflected back to Earth by the Ionosphere or are constrained to hug the Earth's surface due to their reaction to the electrical characteristics of soil and water. So aliens would not be able to receive these. The only significant AM transmissions on VHF with reasonable range are aircraft communications. However, these are so intermittent and fleeting that one can listen for ages on a single channel before, with luck, capturing a couple of terse phrases from a pilot or air traffic controller. Not much to go on for an alien. I remember the advent of VHF FM public radio broadcasts in the UK. I was in the Third Form at Colchester Royal Grammar School. That must have been 1956. To create an FM (frequency modulation) radio signal, a voice is imprinted upon the radio wave by varying the frequency of the wave in sympathy with the intonations of the voice. The amplitude of the carrier is constant. It merely deviates back and forth from its central frequency as shown on the right. I would not think the interpretation of an FM signal to be quite so self-evident as for an AM signal. Nevertheless, I think an alien race capable of building radio receivers should be able to figure it out. So for the aliens, the radio window was still open to receive public broadcast transmissions from Earth. Pretty well all significant non-public transmissions had by that time started to use Single-Sideband (SSB) and other exotic forms of modulation, which the alien would have little chance of deciphering. An SSB signal is created by generating a very low power AM signal and then removing the carrier and one of the sidebands. The remaining sideband is then amplified to the level necessary for transmission. On the right is the spectrum profile of an SSB signal. Here, the upper sideband is the one that has been select­ed for tranmission. I have listened to lots of SSB trans­missions. But I am able to do so only because I am human. An SSB trans­mission, as received, sounds unintelligible. Some people liken the sound to the voice of Donald Duck in a drunken rage. Nothing is distinguishable. This is because the carrier wave is in fact necessary in order to make the sideband information intelligible. However, the information that the carrier contributes is already known to all human beings, including the person listening to the transmission on his receiver. 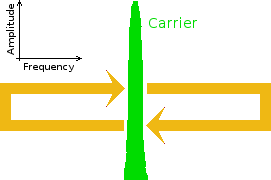 The carrier wave accounts for well over over half the power of the transmission and only one side-band is necessary to convey the specific information in the remaining part of the signal. Consequently, by removing the carrier and one side-band from the transmission, you can pump up the power of the remaining sideband many times. The resulting transmission is also able to penetrate static and other forms of interference better. Nevertheless, removal of the carrier has removed some necessary information from the signal. It is only because, as a human being, I know what a human voice is supposed to sound like that I can reinsert the carrier correctly within my receiver to get a full AM signal back again. However, the carrier I insert within my receiver need only be of milliwatt power instead of the kilowatts needed for transmission of an AM carrier wave. I know two languages: English and Portuguese. Nevertheless, I can tell when a voice sounds human even if it is speaking French, German, Russian, Chinese, Jap­anese or whatever other language. I, as a human, already possess this contextual information. The alien doesn't. So if an alien were to receive an SSB transmission from Earth he would not know where, or even if, he should reinsert the carrier wave to make it sound human. All other exotic forms of modulation create the same problem for an alien. Right now, in 2011, AM and FM broadcasting is on its way out. Digital broadcasting is taking over. Nothing in the digital signal of a human voice has any similarity to the sound it is carrying. This is because the sound is not just modulated: it is encoded. 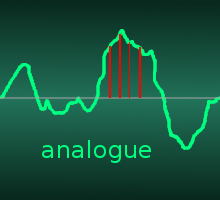 The waveform of the voice's amplitude is sampled electronically every, say, 125 microseconds. The time interval used depends on the quality of sound required. The red lines in the ill­ustration on the right represent 4 consecutive samples. The amplitude (height of the wave) of each sample is measured. The measured amplitude of a sample is usually ob­tained as a voltage. The magnitude of this voltage is then converted into (or expressed as) a binary number. This is sent as a series of pulses as shown on the left. It is this series of pulses, not the amplitude itself, that is then modulated onto the carrier wave. It is clear from the illustrations that the binary pulses bear no resem­blance to the intonations of the voice represented by the original waveform. When received through a con­ventional radio receiver, the signal will not sound in any way like the original voice. The only way to retrieve the original sound is to know the precise details of how it was originally sampled and digitised at the transmitter. This is far from self-evident. It is not something you can, without some kind of foreknowledge, readily derive by examining the signal. 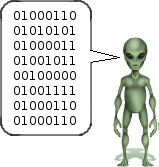 Besides, many digital transmissions are also encrypted, so not even a human can work out how to hear it. The only person who can recapture the original sound is the one for whom it is intended and who has the appropriate decryption key. The alien has no chance. He has no context or frame of reference with which to even begin. Once conventional AM and FM VHF transmissions disappear, the window will close. If this happens in 2028, then the window during which aliens will have had the opportunity of detecting intelligent signals from Earth will have lasted 100 years. The window of detectable transmissions will then continue forever into space as a spherical shell 100 light-years thick. There it will become ever weaker until it disappears below the celestial noise. Although VHF signals can escape the Earth, celestial noise at such frequencies is rather high. Any receivable signal must be of a strength significantly above the background noise level to be receivable. Any VHF signals that manage to escape the Earth's ionosphere will rapidly get buried in the general natural radio noise emitted by the Earth and the universe in general. The electromagnetic spectrum in interstellar space only becomes relatively quiet (or dark) between 1 and 10 GHz. To transmissions above 10 GHz, the Earth's atmosphere itself rapidly becomes foggy. The only devices of great number that use this quiet part of the spectrum are some cell phones (GSM 1800 at around 1·8 GHz) , WiFi-type data networks (at around 2·4 and 5 GHz) and Bluetooth devices (again at around 2·4 GHz). But such devices are extremely low powered. And besides, they are digital and use very sophisti­cated encryption. So extraterrestrial intelligences would not fare well with these. The Milky Way galaxy is thought to contain about 200,000,000,000 stars. Assume for the moment that they are equally distributed across the galactic disc, which, in reality, they're not. The area of the little white dot is π × 80² square light-years. The galaxy is 50,000 light-years radius. Its area is therefore π × 50,000² square light-years. The galaxy is therefore 50,000² ÷ 80² = 390,625 times the area of the little white dot. The little white dot should therefore contain about 200,000,000,000 ÷ 390,625 = 512,000 stars. The question is: how many of these 512,000 stars under the little white dot are Sun-like and have life-bearing planets orbiting around them? The Sun is a particular kind of star called a medium-sized 2nd- or 3rd-generation star. To the best of my limited knowledge on the subject, this means that it - and its solar system - condensed from the gaseous remnants of a larger older star that exploded. The immense temperature of the supernova explosion caused elements other than hydrogen and helium to be synthesised. So the gaseous remnants included a small proportion of these heavier elements. These heavier elements provided the material, which formed the rocky planets of the inner solar system. It is from these elements also that life on Earth is constructed. The Sun is in its main sequence. It is in its phase of life during which it produces energy at a fairly constant rate for a long time. It has been in this phase for over 4 billion years and should remain stable enough for life on Earth to continue another billion years. It also produces its energy in a spectrum that is pretty well centred within the scope of human vision. This facilitates photosynthesis, which is the motor of the Earth's ecosystem. To have this kind of energy spectrum, a star must be from 0·8 to 1·04 times the mass of the Sun. Only 7·5% of main-sequence stars are between 0·8 and 1·04 solar masses. That is, sufficiently like the sun to be able to provide a stable orbit for an Earth-like planet. This reduces the number of candidate stars to 38,400. 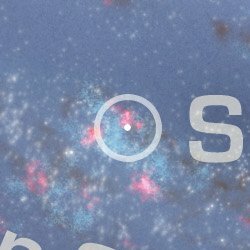 Half of all stars are members of a multiple system. That means 2 or more stars are in mutual orbit. Within such systems, all bodies (stars and planets) have very chaotic orbits. No planet therein could possibly have a stable orbit, which would be essential in order to maintain the conditions necessary for life. This effectively reduces the number of candidate stars to around 19,200. The sun is located in the Orion Spur, about 26,400 light-years from the centre of the Milky Way galaxy. Here, the number of stars per unit volume of space is much lower than the average for the galaxy as a whole. The figure of 19,200 stars is therefore far too high. The NASA/JPL "Nearby Stars Project" was established to catalogue all the Sun-like stars within 25 parsecs of Earth. That is just over 80 light-years, the distance that early radio signals could have reached by now. The anticipated number of Sun-like stars within this radius is 7,500, although to date (mid-2011) only 2,635 Sun-like stars have been catalogued on the database. Consequently, the best available estimate for the number of Sun-like stars within 80 light-years of Earth is currently 7,500. Notwithstanding, radio broadcasts intended for reception within the Earth's biosphere, as we have seen, do not readily lend themselves for easy reception or interpretation by aliens. And the time-widow during which they could be receivable is only 100 years wide. An alien intelligence has a better chance of receiving a signal that is deliberately designed for reception by alien intelligence. This could be beamed at high power towards stars thought to be good candidates for having life-bearing planets in orbit. The content of the message must, on the one hand, contain enough specific­ness to be recognisable as the product of an intelligent mind rather than a blind natural phenomenon. On the other hand, its content must not depend for its interpretation on any restricted context that can only be known to humans on Planet Earth. It must only contain what can be understood in the context of what is available everywhere in the universe. The content of the message must therefore relate to something natural and universal. I remember a BBC television series "A for Andromeda" in 1961. The protagonists received a radio message from aliens somewhere in the Andromeda Galaxy. 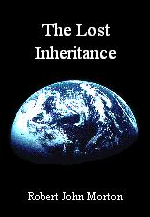 The Andromedans concerned would have had to have reached their technological revolution over 2½ million years ago in order to transmit their message. This would mean that they would have had to have evolved to at least our present stage of development 2½ million years earlier. I think I remember rightly that the initial context-establishing part of the message gave a series of numbers relating to the possible energy states of the hydrogen atom. That should be universal enough. However, I think the alien message in the film "Contact" in 1997 had a better preamble. It comprised groups of audible pulses representing the prime number series from 1 to 101. This, I think, is even more fundamental and therefore more universally recognisable. So, perhaps the best way for an extraterrestrial intelligence to know that we exist is not to attempt to decipher our broadcasts but for us to beam a transmission of prime numbers into space. But how far could our signals reach? The first message directed at possible extraterrestrial intelligences was beamed into space from the giant Arecibo dish in November 1974. This means that today (2011) this message has been "on the road" for only 37 years. This means that the message can only have reached out to 37 light-years from Earth. 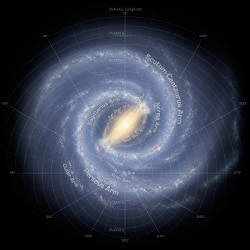 Regarding the Milky Way galaxy as a fairly flat disc and dividing the area of a 37 light-year radius disc by that of a 80 light-year radius disc, we are left with only 1,600 Sun-like stars. Is this enough for there to be a chance that some of these Sun-like stars should have an Earth-like planet? Out of these, what is the chance that some of these Earth-like planets will be orbiting within its sun's habitable zone? Venus's orbital radius is 70% that of Earth's. There it is far too hot to sustain intelligent life. Mars's orbital radius is 50% more than Earth's. There it is far too cold to sustain intelligent life. Some suggest that there is only a 2% probability of a planet being in its sun's habitable zone. That leaves only 32 sun-like stars with a possible planet in its habitable zone. Merely being within the habitable orbital range of a Sun-like star is not, however, all that is necessary for a planet have an environment that can initiate and sustain a process that results in the emergence of a self-aware intelligent life-form. There are many more, each of which must be somehow held within fairly tight limits. The planet must be large enough to form a surface of tectonic plates. These must flow at a rate that is slow enough to maintain a surface stable enough for the safe habitation of life, yet fast enough to recycle minerals at the rate required for life. Venus is only 82% the mass of Earth. It cannot sustain a tectonically active surface. The lower limit of planet mass for tectonic activity is probably 90% of Earth's mass. On the other hand, if the planet is going to support self-aware intelligent beings, it cannot be too large. A self-aware intelligent being must be accommodated within a brain of adequate size and complexity. This brain, in turn, must be accommodated inside a hydrocarbon-based body of adequate size to sustain it within the planet's biospheric environment. The size and strength of hydrocarbon-based bone and tissue depends on the nature of chemical elements, which is not scalable. If the planet were too massive, its gravity would impede and possibly crush such a life-form. I weigh 82kg but if I were on a planet where my weight were doubled, I think I would be hard pressed to move under my own strength to carry out my day-to-day tasks of life. Assuming the same density, this planet's diameter would be only 26% more than Earth's. The mass limits for a habitable planet are therefore likely to be between 90% and 150% of the Earth's mass. That is a fairly tight limit. As well as being the right mass, a planet capable of hosting intelligent life also needs to be the right size so as to have a reasonably linear gravitational field at its surface and to hold an atmosphere of adequate pressure over the habitable height range of its surface. This demands that its material composition be very close to that of the Earth. Part of its necessary composition must be a heavy iron core, which, coupled with an abnormally rapid spin, produces a magnetic field sufficient to protect its surface from dangerous particle radiation that is inevitably emitted by an appropriately sized sun. To be able to harbour intelligent life, the planet must also have an atmosphere. This must be of a density and composition within limits that will filter out harmful electromagnetic radiation while supporting an appropriate rate of metabolism for an intelligent life-form. A life-bearing planet must have extensive regions of water. This must come from somewhere after the planet has formed and cooled sufficiently for the water to remain liquid. The primordial gas cloud from which its solar system condensed must therefore contain water parked sufficiently far out from the forming star and embryonic inner planets. Presumably the water would be held initially as ice comets in very distant orbits. To provide an environment for life, however, these extensive regions of water on the planet's surface cannot remain static. They must move in order to transport the elements essential to life and power the essential cycles of the ecosystem. This requires oceans with tides and a weather system that brings wind and rain to maintain the land areas in a constant state of erosion, which tectonic action will then renew. This requires the planet to have a moon of the right size and at the right distance. In this regard, the Earth and Moon are a most unusual combination. The size and distance of the Moon also stabilises the tilt of the Earth's rotational axis between 21·5° and 24·5° over a 41,000 year cycle. It also helps stabilise the rate at which the Earth's axial tilt precesses over a 26,000 year cycle. The axial tilt and precession creates seasons and a complex-dynamical weather system. Such a system does not gravitate to a completely stable state or rhythm but rather is constrained to follow a very complex form of behaviour. Nevertheless, this complex behaviour has form and bounds. It is bound to follow - or be pulled towards - a form of behaviour called a strange attractor. The famous Lorenz Attractor depicts the behaviour of the Earth's weather system. This bounded complex behaviour is benign in that it provides the transport and mixing necessary for life-forms to exchange material with their biospheric environment as necessary to support their life-processes. Although complex-dynamical, the biosphere of a life-supporting planet must be powered by a stable energy source. This requires that the planet's orbit around its sun be almost circular. 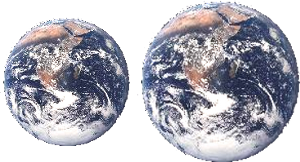 The Earth's orbital eccentricity is only 0·0167. Its orbit's minor diameter is only 0·02% less than its major diameter. Unfortunately, 90% of planets outside the solar system have an orbital eccentricity greater than 25%. The electromagnetic radiation falling on the surface of such a planet would oscillate between limits much too far apart to provide the stability required for an intelligent life-form. Life on Earth thrives in a wide range of environments from cold transparent fish in the Antarctic Ocean to extremophiles in the superheated water of under-sea volcanic vents. This life, however, is not classed as intelligent. The only form of life we classify as intelligent is the self-aware conscious human being. And the human life-form is essentially a tropical animal. Outside the tropics, the human must have clothing, shelter and, in winter, an external artificial heat-source. I feel completely comfortable to relax or work only within a temperature range of 23±3°C. All these conditions for a planet capable of supporting intelligent life cumulatively diminish the chance of such a planet existing within the universe. The chance of one existing within the 80 light-year range for possible radio communication with an alien intelligence is therefore minuscule. But suppose intelligent life could be based on different chemistry that can thrive in environments that would be lethal to us? Perhaps an intelligent life-form could be based on silicon instead of carbon. The problem with this is that carbon definitely forms the best Lego set for building life. It is doubtful whether other chemistries could support the complexities necessary for intelligent life. If there were a chance for silicon (with which the Earth is well endowed), why has no silicon-based life ever developed in some of Earth's more extreme environments? Where advanced life is concerned, carbon is king. And if alien intelligent life must be based on the same chemistry as ours and has had the same time to evolve since the Big Bang, then is should be very much like us right now. Nevertheless, we are left with the same minuscule probability of intelligent life existing within contactable range. The chance of a solar system, containing a planet with the exacting specification needed for it to support intelligent life, condensing out of the gaseous remnants of a supernova seems diminishingly remote. The chance of each requirement being met is small and all the chances are cumulative: they are chances within chances within chances. But perhaps the way a solar system condenses out of a gaseous cloud isn't governed by pure unfettered chance. The weather seems to be governed by chance but it is now known that it isn't. It is governed by complex dynamics. Its behaviour is complex, yet deterministic. 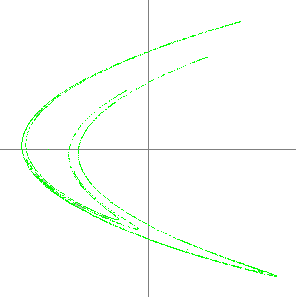 Its behaviour is constrained to Lorenz's Strange Attractor as depicted above. So-called strange attractors determine the behaviours of many natural phenomena. For example, Hénon's Strange Attractor, shown on the right, represents the bounds to which the complex orbit of a star is constrained as it mean­ders around its galaxy. Could the way in which the gaseous remnant of a supernova explosion condenses into a 2nd or 3rd-generation solar system also be governed by a strange attractor? If so, then the form such a solar system must take with its sun, inner rocky planets, asteroid belt, outer gas giants and remote wandering comets may be inevitably determined by the attractor. The sizes, compositions and spacings of the solar system's members may thus be tightly pre-determined by the initial conditions within the gas cloud from which they condense. One of the characteristics of a complex dynamical system is that very small differences in its initial conditions can give rise to vastly different results in the long-term. Nevertheless, all results, however long-term, are not completely free to chance. They are constrained to bounds defined by the attractor. Their freedom to vary is minuscule compared to unfettered chance. This astronomically increases the probability of an Earth-like planet existing elsewhere. Perhaps the number and orbital spacing of the planets is prescribed by some kind of strange attractor driven by some kind of gravitational resonance. And perhaps even the formation of life's building bricks is also determined by a strange attractor. I could even be tempted to suggest that perhaps intelligent life itself could be the inevitable progeny of an as yet unknown strange attractor by which the behaviours of biochemical reactions are constrained. If so, the complex-dynamical principle of sensitive dependence on initial conditions could also cause the evolution of life in different places to make its quantum leaps at different times. This opens the possibility for alien intelligence to have reached a very different stage of development than we have reached at this time. If so, there is a fighting chance that there exists, within communicative range, alien intelligence advanced enough to be transmitting speculative messages into the cosmos in the hope that such as we may hear and respond. 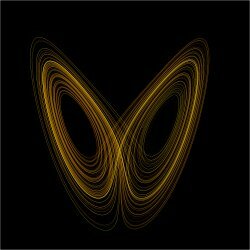 It is true that complex-dynamical systems, following their strange attractors, can evolve from simple to complex. This evolution is a process during which energy is lost by the system thus increasing the tranquillity within it and thereby allowing its separate elements to connect into fewer, more complex, configurations that are permitted by their inherent protocols of interaction. Thus, the gaseous remnant of a supernova can evolve from a disorganised cloud of gas and dust into a more organised solar system with a sun, rocky inner planets, outer gas giants and so on. Life is a complex-dynamical system. A life-form, however, is something more. A life-form is a kind of system that I term a device. I define a device as a system that contains and performs a higher function. That is, a device fulfils a purpose that is nowhere derivable from within the material from which it is composed. This being so, a complex-dynamical system can never evolve into a device under the influence of nothing more than its resident forces and inherent protocols. The material components of a device merely form a vehicle that contains and facilitates the higher function. The higher function itself has to be deliberately programmed into the device by some form of external intelligence. A good example of higher function is the human body. The higher functions of the various organs, and of the body as a whole, are way beyond the bounds of the strange attractors that may govern the complex-dynamics of biochemistry. The functionality of the human body is nowhere prescribed within the protocols whereby chemical elements combine and separate. The blueprint to build the higher-function device we call the human body is contained, in coded form, within each of its cells. This information cannot have materialised as a result of blind biochemical reactions. The DNA molecule, that specifies the individual characteristics of a human being, cannot be synthesised in a chemistry laboratory. Neither could it have self-synthesised in the biological soup of an ancient ocean. The necessary and sufficient information is available neither within itself nor within its material environment. So the idea of intelligent life evolving unaided from simple things like proteins and amino-acids is fundamentally flawed. Consequently, for intelligent life to exist on another world, is would seem necessary for some form of external intelligence to have visited that world to engineer a living cell with the encoded functionality of an intelligent life-form. Science folklore abounds with notions of ancient astronauts who visited the Earth thousands of years ago and imbued an ape-like life-form with human intelligence and consciousness. If so, where have they gone? Basic politeness should have moved them to have left us with an objective unambiguous consistent untamperable message about our origin and destiny. But out of all the available ancient texts, no message so qualified seems ever to have been found. In 1967 some radio astronomers at Cambridge discovered a pulsing radio signal coming from outer space. The pulses were regular but contained what appeared to be arbitrary variations in tone from one pulse to the next. These variations in tone could conceivably be taken to be some form of modulation that is superimposing intelligence onto the regular pulses. Could this be a signal from little green men? Unfortunately there is a more plausible natural explanation. The variations are not part of the original signal, which is simply the regular pulsing of a spinning neutron star. The variations are imposed upon the signal during its transit through interstellar space on its way to the Earth. The variations are thought to be produced by two physical effects. One is frequency dispersion caused by the interstellar medium comprising between 106 and 10-4 molecules or ions per cubic centimetre. The second effect is caused by scintillation. This is the interaction between components of the signal that arrive via slightly different paths. Since the first discovery of a pulsar in 1967, many more have been found. Even amateur radio astronomers with home installations can receive and extract their distinctive signals. It should be noted, however, that the pulsed radio signal from a pulsar is unimaginably powerful. Yet, all that arrives at the receiver appears to be nothing more than random noise. A lot of digital signal processing is needed to extract the pulsar's rhythmic audible clicks from this noise. No alien life-form inhabiting a planet could possibly muster such immense power to transmit intelligent signals. Therefore, any signal from an alien intelligence must necessarily be many many orders of magnitude weaker than a pulsar. The first pulsar is currently thought to be over 2,000 light-years from the Earth. The closest is 280 light-years distant. Any artificial signal would therefore have to be very much closer to be detectable. Scientists have been looking for intelligence-bearing radio signals arriving from outer space since the early 1960s. Serious well-funded projects only started in the early 1990s. And to date (mid 2011) they've all found precisely nothing. Were the evolution of radio transmission on an alien world anything like humanity's own casual radio emissions over the past 80 years or so, human searchers for extraterrestrial intelligence would be unlikely ever to receive anything. Their only real hope is for ET to make deliberate and powerful transmissions into space somewhere between 1 and 10 GHz. And from what I can gather, this is what the searchers are doing. They train their parabolic arrays on what they think are likely targets for alien life. They then analyse the masses of radio noise they receive, in the hope that their software will be able to parse out some intelligibility buried within it. I once heard an intercontinental conversation between radio amateurs using Moon-bounce. Each beamed his signal at the Moon and the other received the signal reflected back to Earth from the Moon. The delay between one speaking and the other responding seemed quite disconcerting. I notice something similar on the BBC World News when one presenter is in London and the other is in Singapore. There is an unnatural and awkward delay between the presenters' questions and responses as they converse. Although real-time conversation may be impossible, the receiving of a complete message from distant alien intelligence could be feasible. The range 1 to 10 GHz is a lot of radio bandspace to cover. So where is the best place to look. 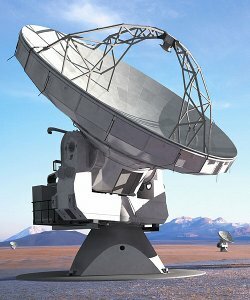 Where would an alien intelligence expect us (or any other alien intelligence) to look for intelligence-bearing signals from outer space? Within this quiet stretch of the radio spectrum there are two prominent all-pervading natural signals. One is the Hydrogen Line on 1420 MHz. This is produced by the interstellar hydrogen that populates outer space at a density of around 1 atom per cubic centimetre. The other is the Hydroxyl Line similarly produced by residual hydroxyl radical OH at 1666 MHz. These natural signals are reckoned to be equally receivable wherever in the universe the observer may be. They should certainly be known to any intelligence capable of transmitting interstellar radio signals. The radio band delimited by these natural H and OH signals is known as the Water-Hole. This is because H combines with OH to make H2O (water). It is likely, therefore, that any alien race wishing to communicate would transmit on a frequency somewhere within the Water-Hole. What kind of signal do these searchers for extraterrestrial intelligence expect to find? In popular SETI-type films like A for Andromeda and Contact the researchers stumble across a slow pulsing signal that seems to be amplitude-modulated with a bit of rough audio. From the signal, the fictitious researchers quickly discover quantities of information within the signal so vast as to enable them to construct an Andromedan life-form or a worm-hole device that transports the protagonist 25 light-years to the Vega star system. Such a signal cannot, in any way, possess enough intelligence-carrying capacity to convey such vast amounts of information over such a vast distance within the kind of time-scale portrayed. As any intelligence-bearing radio signal travels, its intricate profile becomes less and less distinct. Its integrity diminishes. The various frequency components of the signal's profile gradually disperse away from each other. The effect is that any intelligence the signal initially bore will eventually become indiscernible. I have no firm data by which to quantify this dispersion effect. Nevertheless, intuition suggests to me that, for a conventional analogue signal, it would be catastrophic over interstellar distances like the 25 light-years from Vega. And I am sure that any more advanced alien intelligence would know this. The elements of a digital signal have a much simpler profile. This makes them much less vulnerable to the effects of dispersion. So long as the profile of the signal does not fall below the level at which you can determine whether a pulse is present or not at a particular instant, the signal will remain perfectly discernible. This fact gives a digital signal a much longer effective range. It therefore has a much better chance of surviving interstellar distances. I think, therefore, that any truly intelligent alien would definitely opt for digital. Unfortunately, a digital signal has another problem. 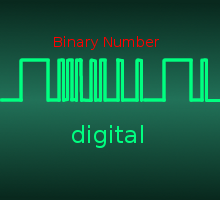 Unlike an analogue signal, a digital signal is, by its very nature, coded. In a digital signal, the varying amplitudes of the sound are represented by sequences of binary digits, as described earlier. Characters of text are represented by standardized digital codes such as ASCII or UTF-8. These representative codes are open knowledge here on Earth. They are not encryptions. The objective is not privacy but technical integrity. If ET were trying to gain our attention with a digital signal, he would not therefore encode his signal with the intention of preventing us from interpreting it. He would digitize it simply to protect its integrity during its long interstellar journey. The problem is that we have no idea what coding he would use. It is doubtful whether he would know our ASCII or UTF-8 coding schemes. The way ET would digitize the spot amplitudes of a voice wave-form may be a little more self-evident in principle. Nevertheless, we would have to guess how many bits he used for each sample and also the sampling rate. Nevertheless, we could never be sure that what we were hearing was ET's true vocal sounds. A further problem is that the narrow frequency range of a conventional radio signal - analogue or digital - leaves it very vulnerable to natural interference. During many decades of travel, natural electromagnetic events along its path are likely to obliterate a significant proportion of the information it is carrying. The only way to combat this is to spread the signal's spectrum. Its frequency span must be widened. ET would therefore have to use a modulation and spreading scheme similar to that used for WiFi here on Earth. There are many possible ways of doing this. Here on Earth, there are many standard ways of doing this. Which one will ET have chosen to use? A signal becomes less vulnerable to interference the wider it is, that is, the more its spectrum is spread. But frequency dispersion also spreads the signal as it travels. Consequently, it is less vulnerable to interference sources that are closer to its destination and more vulnerable to interference sources that are closer to its origin. Notwithstanding, ET cannot afford to spread his signal too much artificially before transmission for fear of it becoming too spread out to be detectable after its interstellar voyage. So what digital coding scheme will he use? What data rate will he use? What spectrum-spreading scheme will he use? How much will he spread his signal's spectrum? Perhaps he will use a high data rate and spread his signal over the entire 246 MHz of the Water Hole. Perhaps he will spread it over the entire 9 GHz of the Quiet Band. What if all or part of his signal is red-shifted outside our receiving window? 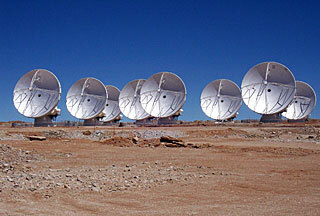 If ET be more advanced than we, he may use a signal structure that is yet to be discovered here on Earth. Is there - could there be - a self-evident digital code based on natural universals? Is it staring at us from the sequence of primes or hiding within an enigmatic Monster of Symmetry? Is the answer to a natural self-evident spreading scheme there also? If so, this is undoubtedly the way any advanced alien intelligence would try to make itself known. Having said all this, I am afraid I do not think that even the most advanced form of digitized spread-spectrum signal could survive the journey of 2½ million light-years from the Galaxy of Andromeda. Apparently, enthusiasts throughout the world build their own amateur receiving stations specially for searching for signals from extraterrestrial intelligence. From what I can gather, the recommended approach is to listen in single-sideband (SSB) mode using a bandwidth of 22 kHz. The audio noise signal thus received is then fed to the line-in audio jack of a personal computer. Freely available signal analysis software running on the PC then divides the 22 kHz signal into 2048 channels. Presumably each of these 2048 channels is 10·7 Hz wide (or perhaps 10 Hz wide with a bit of separation space in between them). Each channel is then analysed for any evidence of non-randomness within the noise. Any non-random component within the noise is taken to be evidence of an intelligent signal. Clearly, if ET is sending any kind of spread-spectrum signal, this approach will be useless. If ET spreads his signal over the width of the Water Hole, the human listener would have to monitor 24,600 channels simultaneously. If ET spreads his signal over the entire Quiet Band, it will be necessary to listen on 900 million channels simultaneously. It would be no use sharing out this listening task among 11,182 or 409,091 SETI enthusiasts respectively. This would be like trying to listen to a multi-track tape with the pick-up heads spaced at arbitrary distances along the tape. The different tracks would be out of synchrony with each other. Unhappily, I think that all this makes the odds of receiving a signal from an extra­terrestrial intelligence very unlikely with current (2011) technology. The final and perhaps the most frustrating problem for searchers for extra­terrestrial intelligence is that sections of the Water-Hole are already officially allocated for terrestrial and Earth-satellite radio traffic. Some of the official band allocations are shown below. Only the green stretches are reserved exclusively for radio-astronomy. There is doubtless also plenty of unofficial traffic within the Water-Hole in some parts of the world. This doesn't exactly make it easy to find, among all this human-made traffic, potential extremely weak signals from a planet in a different solar system. And this traffic will be sure to increase as near-Earth space becomes more utilised. Notwithstanding, suppose that one day these searchers for extraterrestrial intel­ligence do receive an intelligence-bearing signal from up to 80 light-years distant. The signal from the aliens will have taken 80 years to reach us. The aliens who sent the signal will not receive the reply from Earth for another 80 years. That's a round trip delay of 160 years. So it could only possibly be the grand-child of the first human recipient of the alien message who could possibly receive the alien's response to his reply. The original searcher will be long dead. Yet there is still no word from space. Large numbers of people report sightings of what appear to them to be alien craft. Some even give account of encounters with intelligent beings that are distinctly non-human. Perhaps the majority of such accounts are the result of imagination or psychosis. Perhaps others are rare natural phenomena such as mirages, St Elmo's Fire or ball lightening. A lot of sightings coincidentally occur in localities where there is extreme pressure between tectonic plates below the ground. Perhaps such pressure causes rock materials to emit particle beams that ionise the atmosphere far above the ground to produce what appears like alien craft or spirits. Notwithstanding, some observations could conceivably be genuine. However, if non-human intelligent beings exist and make meaningful contact with certain humans, they are unlikely to be from deep space but rather from right here in dimensions that are beyond the reach of human senses and instruments. Unless, of course, astronomers are very wrong in their perception of the universe.